When working with prefinished flooring, it’s important to keep in mind that the finish is permanent. While that sounds obvi­ous, flooring contractors used to installing unfinished wood flooring sometimes find it difficult to transition to prefinished flooring. They’re used to working directly atop an unfinished floor that will receive a heavy-duty sanding. 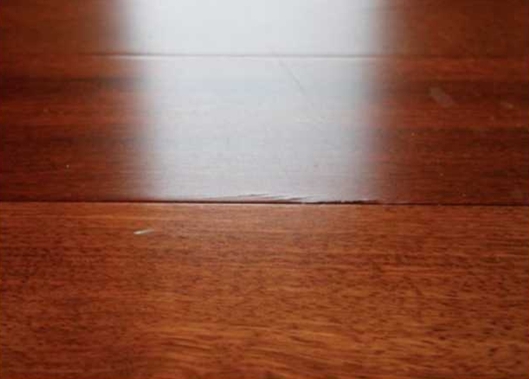 Protect prefin­ished flooring from damage. Place tablesaws, miter saws, and hand tools on a clean piece of carpet placed upside down or on something that offers equivalent protection. Rough handling of prefinished flooring, using improper tools, and improper compressor settings when using pneumatic nailers can damage the edges of the flooring. Avoid striking the edge of prefinished products with the flooring mallet. This can cause edge crushing, unsightly finish cracks, and splinters. Even using a rubber mallet to tap flooring boards with a low-gloss finish into place can burnish the finish. Manufacturers make adapters for flooring nailers that do not damage the boards’ edge finish. Use colored fillers and touch pens from the manufacturer to correct any minor imperfections in prefinished flooring before anyone has a chance to judge the quality of your installation. Do this as soon as possible—once someone sees one imperfection they will search for more.